1 of 4 Heat oven to 425 degrees F. Coat a baking sheet with nonstick cooking spray. In a small skillet over medium-high heat, toast 1/4 cup walnuts for 5 minutes. 2 of 4 Stir together mayonnaise and 1 tablespoon of the mustard. Finely chop remaining 1/2 cup walnuts. Brush tilapia with mustard mixture, then sprinkle with 1/2 teaspoon basil and 1/8 teaspoon each salt and pepper. 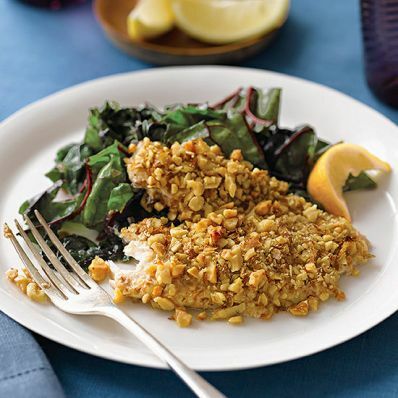 Press 2 tablespoons chopped walnuts onto one side of each fillet. 3 of 4 Place tilapia, walnut-side up, on baking sheet; bake at 425 degrees F for 15 minutes or until fish flakes easily. 4 of 4 Heat oil in a large skillet over medium-high heat. Add onion; cook 4 minutes. Stir in Swiss chard, remaining 1/2 teaspoon basil and 1/8 teaspoon each salt and pepper; cover. Cook, stirring, for 7 minutes or until tender. Add 1/4 cup water if pan becomes dry. Stir in walnuts and remaining 2 tablespoons mustard.